Here you see Leslie looking lacey in a pretty 1960's dress. It is ecru lace that has a cropped top on the dress to give it a 2 piece look. It has brown satin underneath to accent the waistline, and a cute little bow at the side. Watch out boys!! 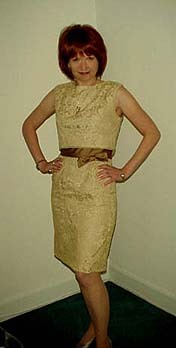 Here the lovely Lulu wears a sparkling ivory and gold button up dress from the 60's. It has clear plastic button with rhinestones. She has accessoried it with some of her bakelite jewelry for a night out on the town. This is the delightful Dawn (in front and back views) wearing a cute little gothic dress (that doubles as a cute Summer dress too) It has a low cut back and full skirt. It is accented with 2 tiny rhinestone buttons on the back, a great attention getter!